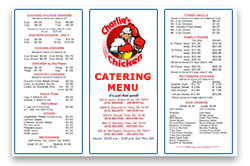 Let Charlie’s cater your next event with our delicious homemade comfort food! We love to cater corporate meetings, parties, banquets, rehearsals dinners & wedding receptions. We are willing to accommodate special requests for items that we do not usually offer on our menu.